Friday, November 16th from 11am to 7pm – Surprise discounts and fun all day! Jules Accessory Trunk Show and Cocktail Party 4 to 7pm! 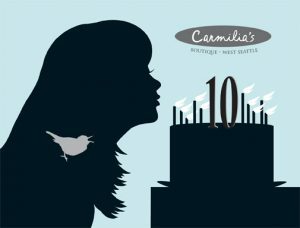 Saturday, November 17th from 11am to 6pm – Come and play Carmilia’s Trivia to see if you are a Perfect 10 to win a 10% to 80% Discount! Bubbly and snacks served all day! Carmilia’s is located in The West Seattle Junction at 4528 California Ave SW, Seattle 98116.